1000toys is proud to present a 1/12 scale fully articulated Hellboy action figure from Mike Mignola's masterpiece comic series. 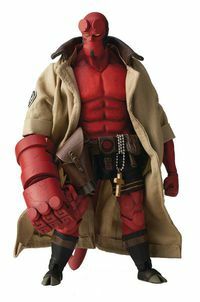 Developed to capture the touch of Mike Mignola seen in the original art without giving up anything in articulation this will be the Hellboy action figure that fans have been waiting for! Legal Notice: Entire contents trademarked (® or TM) and copyrighted (©) 1986-2019 by Things From Another World, Inc. and respective copyright and trademark holders. All rights reserved. Page rendered at 2019-04-19 01:49:11 in 0.186 seconds.